Quebec is conducting an active surveillance program for rabies, particularly the raccoon strain that is present across the border in the United States. Here is an update on this program as of August 22, 2014. The map shows the locations where animals tested for rabies were found as well as cases in the USA up to July 21, 2014. As you will see in the chart, the collection of specimens for testing in 2014 so far has been very similar to 2013. 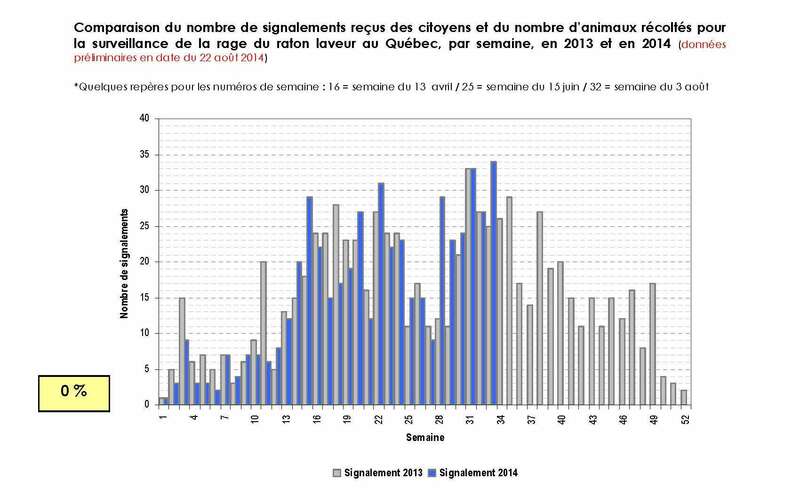 No cases of raccoon rabies have been detected in Quebec since 2009. Locations of animals collected for surveillance of raccoon rabies in Quebec and across the border in the United States in 2014. Animals that tested negative are shown in green; results pending are shown in yellow; animals not tested are shown in blue.